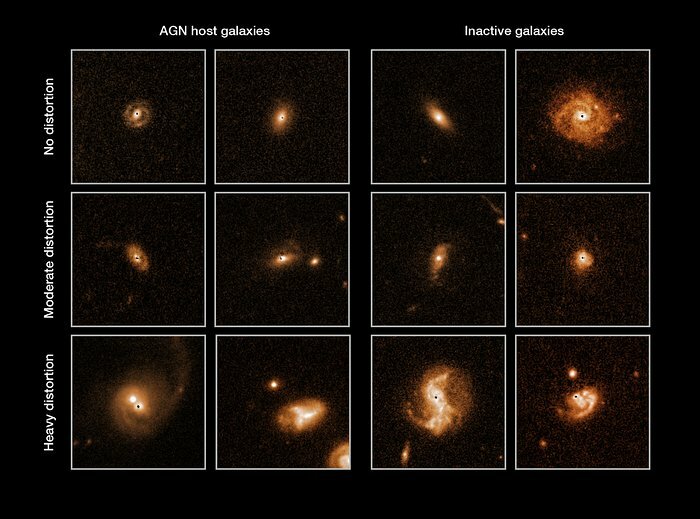 A team of astronomers studied over 1400 galaxies snapped by Hubble in the COSMOS survey, to test the hypothesis that galactic mergers trigger active galactic nuclei (AGN). In order to make this a blind test, the team modelled and removed the active nucleus (which normally appears as a bright spot) from each galaxy, and then cosmetically added a similar mark to the galaxies without an AGN, to make them visually indistinguishable. This explains the black dot visible near the centre of each of these images. They then categorised the galaxies, according to whether they showed no sign of recent mergers (top), minor signs (middle row) or clear signs of disruption from a recent merger (bottom). Analysing these results, they found that galaxies with active nuclei (left) and those with inactive nuclei (right) showed no statistically significant difference in the proportion that had undergone mergers. This means that processes other than galactic mergers must trigger AGN activity.